Sebastian Giovinco (Italian pronunciation: [seˈbastjan dʒoˈviŋko]; born 26 January 1987) is an Italian professional footballer who plays for Saudi Arabian club Al-Hilal and the Italy national team as a forward. A creative player on the ball, with excellent vision, technical skills, and an eye for goal, he is a free kick specialist and is capable of playing in several offensive positions. Due to his short stature, dynamic abilities and pace, Giovinco acquired the nickname formica atomica ("atomic ant", after the eponymous Hanna-Barbera character) in his youth. In 2015, he was named one of the 100 best footballers in the world by The Guardian, FourFourTwo, and L'Équipe. Giovinco began his professional footballing career with Italian club Juventus in Serie B in 2006, where he was promoted to the first team after his success with the club's youth squad; in his first season, he helped the senior side win the title and earn promotion to Serie A, establishing himself as a promising prospect in the number 10 role. After struggling to break into the starting line-up however, he spent successful stints on loan with Italian clubs Empoli and Parma, where he matured as a player, before earning a move back to Juventus in 2012. Upon his return to the Turin club, he won two consecutive league titles, but once again struggled to maintain a spot in the team's starting eleven. This resulted in a high-profile move to MLS side Toronto FC in early 2015, in a deal which made him the league's highest paid player. After joining the Canadian club, Giovinco soon established himself as one of the best players in the MLS. During his first year with the club, he broke several league records, including the record for most combined goals and assists in a single season, also helping Toronto FC to qualify for the MLS Cup Playoffs for the first time in the club's history, and winning himself the MLS Golden Boot, the MLS Newcomer of the Year Award, and the MLS MVP Award. In 2016, he won his first title with Toronto FC, the 2016 Canadian Championship, and became the club's all-time top goalscorer, helping the club to qualify for the Playoffs once again, reaching the MLS Cup Final. In 2017, he won his second Canadian Championship, winning the George Gross Memorial Trophy for the best player of the competition, captured the Supporters' Shield, and also won the 2017 MLS Cup with Toronto FC — for a domestic treble. In 2018, Giovinco helped Toronto FC reach the final of the CONCACAF Champions League, and was awarded the Golden Ball as the tournament's best player, also capturing his third consecutive Canadian Championship with the club, although Toronto FC failed to qualify for the Playoffs. At international level, Giovinco has represented Italy at all levels since first being called up by the under-16 side in 2003; at youth level, he took part at the 2008 Summer Olympics with the Italian under-23 side, and later helped the Italy under-21 side to the semi-finals of the 2009 UEFA European Under-21 Football Championship. He made his debut with the Italy senior side in 2011, and he later took part at UEFA Euro 2012; winning a runners-up medal, and at the 2013 FIFA Confederations Cup; winning a bronze medal, and also scoring his first international goal during the tournament. Giovinco was born in Turin to a Sicilian father, Giovanni, originally from Bisacquino in the province of Palermo, and a Calabrian mother, Elvira, originally from Catanzaro, who moved from Southern Italy. He grew up in Beinasco, a comune southwest of the city, in a family of Milan fans, and joined the Juventus youth system in 1996, when he was nine. His younger brother Giuseppe was also part of the Juventus Youth Academy and currently plays in Serie C.
After joining the Juventus youth system, Giovinco flourished through the ranks of the club and impressed especially during the 2005–06 season, winning the Campionato Nazionale Primavera, as well as the Coppa Italia and Supercoppa Primavera, and also reaching the final at the Viareggio Tournament, where he was named best player of the competition. Giovinco was promoted to the first team during the 2006–07 season and also played his last season in the Primavera squad. His professional debut came on 12 May 2007, in the Serie B match against Bologna; he came on as a substitute in place of Raffaele Palladino, and marked his first appearance with an assist for David Trezeguet's tap-in. Since then, he had been tipped to be Alessandro Del Piero's heir in the creative number 10 role behind the main striker, known as the trequartista, rifinitore, or fantasista, in Italian. Juventus won the Serie B title that season, earning promotion to Serie A the following season. On 4 July 2007, Giovinco was loaned out to Empoli. He made his Serie A debut on 26 August, coming on as a substitute against Fiorentina. Giovinco scored his first Serie A goal on 30 September against Palermo in a 3–1 win. He made his European debut in the UEFA Cup on 4 October against Zürich. Giovinco finished his first season in Serie A with 6 goals in 35 appearances, and was given the Leone d’Argento award, by the club. Despite Giovinco's promising performances, Empoli were unable to avoid relegation, and he returned to Juventus at the end of the season. On 26 June 2008, Giovinco officially returned to Juventus. Giovinco played his first Serie A match for Juventus on 24 September, against Catania, before assisting both goals for Vincenzo Iaquinta in the 2–2 draw with BATE Borisov in the Champions League on 30 September, his first start for the club. On 7 December, he scored his first goal for Juventus, a free kick against Lecce in a 2–1 win. In October 2008, he signed a contract extension, tying him to Juventus until the summer of 2013. Despite a promising start, Giovinco did not play regularly and made sporadic appearances throughout the season, both in the starting eleven and off the bench, as he struggled to fit into Claudio Ranieri's preferred 4–4–2 formation, and was often used out of position on the left wing. However, he did earn praise in the media for the Man of the match performance that he produced when he was started in Juventus's home fixture in Serie A against Bologna on 14 March 2009, in which he first set-up a goal from a corner and later scored another from a half-volley to help Juventus come from behind to win the match 4–1. He eventually finished the season with 3 goals in 27 appearances in all competitions, 2 of which came from 19 Serie A appearances. The following season, when the club's new manager, Ciro Ferrara, was forced into a tactical switch due to injuries to first choice midfielders, Mauro Camoranesi and Claudio Marchisio, Giovinco was variously inserted into the starting line-up; he helped Juventus to a 5–1 defeat of Sampdoria in only his fourth start of the season. Under the following manager, Alberto Zaccheroni, he was hardly featured. In April, he sustained a training ground injury and was ruled out for the rest of the season after undergoing tests. On 5 August 2010, Parma announced the signing of Giovinco on loan from Juventus, with an option to buy half of the player's transfer rights at the end of the season. He made his Parma debut against Brescia in a 2–0 win on 29 August. He scored his first goal for Parma on 12 September 2010, a free kick in a 2–1 loss to Catania. An impressive start to the season earned Giovinco a call up to represent the Italian national team. On 6 January 2011, Giovinco scored two goals for Parma in a 4–1 win against his parent club, Juventus. After initially struggling to settle-in at Parma, he refound his form towards the end of the season and made his break-through with the club, finishing his first season at the club with 7 goals in 30 appearances in the league. At the end of the season, on 22 June 2011, Parma exercised the option to buy half of Giovinco's contract for a fee of €3 million. On 11 September, the first match of the 2011–12 season, Giovinco scored against Juventus once again, where he found the net from a penalty in a 4–1 away defeat. On 6 May, he scored a volley from 30 yards out against Siena in the penultimate match of the season, which ended in a 2–0 away win. In his second season with Parma, Giovinco finished as the club’s leading goalscorer (15) and assist provider (11) in Serie A, helping the team to an eighth-place finish in the league; in total, he made 70 appearances during his two seasons with the club, scoring 23 goals, and providing 22 assists. Giovinco playing for Juventus in the 2012–13 season. On 21 June 2012, Juventus announced that it had purchased the other half of Giovinco's transfer rights from Parma for €11 million, tying him to the Turin club until 30 June 2015. Although he had stated that he would have been pleased to wear the number 10 shirt, which was vacated after Juventus legend Alessandro Del Piero left the club, Giovinco was handed the number 12 jersey under manager Antonio Conte. On 11 August 2012, Giovinco won his first title with Juventus, helping the team to defeat Napoli 4–2 in the 2012 Supercoppa Italiana. Giovinco started in the first league match of the 2012–13 season against his former club, Parma; Juventus won the match 2–0, although Giovinco suffered a minor injury two minutes from the end of the game. In the following league match against Udinese on 2 September, Giovinco scored two goals and won a penalty, which was converted by Chilean teammate Arturo Vidal, as Juventus went on to defeat the Friuli team 4–1 in Udine. Giovinco scored his first career UEFA Champions League goal against FC Nordsjælland on 7 November, a match which Juventus won 4–0 at Juventus Stadium. He scored the third goal as Juventus beat defending champions Chelsea 3–0 at home, and also contributed to Juventus' 1–0 away win against Shakhtar Donetsk, which allowed Juventus to top their group undefeated and advance to the knockout stages for first time since the 2008–09 tournament. On 1 December, Giovinco scored his fifth league goal of the season in the Derby della Mole against Torino, also recording an assist on one of Claudio Marchisio's two goals in a 3–0 victory at home. Giovinco scored the only goal of the match in a Coppa Italia 1–0 win against Cagliari, allowing Juventus to progress to the quarter-finals of the competition; coincidentally, Giovinco (who was wearing the number 12 shirt for Juventus at the time) scored in the 12th minute of the second half of the match, which took place on 12 December 2012 (12/12/12), while the goal was also his twelfth for the club. Juventus eventually managed to retain their Serie A title that season, with Giovinco managing 7 goals in the league, and 11 in total in all competitions, as Juventus reached the quarter-finals of the 2012–13 UEFA Champions League, and the semi-finals of the 2012–13 Coppa Italia, only to lose out to the winners of the respective competitions, Bayern Munich and Lazio. Giovinco missed out on Juventus's 2013 Supercoppa Italiana victory, and he initially went scoreless in the 2013–14 season until finally netting a notable goal in a 3–2 win over rivals Milan on 6 October 2013. Giovinco fell out of form again and struggled to gain playing time, but he managed to break his goal drought on 14 April 2014, with a goal against Udinese, taking the ball past a defender and scoring with a left footed curling shot from outside the box. Overall, Giovinco managed 2 goals in 17 Serie A appearances that season, and one goal in the Coppa Italia, as Juventus won their third consecutive Serie A title. During the 2014–15 season under Massimiliano Allegri, Giovinco scored two goals in a 6–1 win over Hellas Verona in the Coppa Italia, on 15 January 2015, helping Juventus to the quarter-finals of the competition; both of his goals came in the first half, with the first coming from a free kick, and the second in injury time. Giovinco playing for Toronto FC during the 2015 MLS season. On 19 January 2015, Giovinco signed with Canadian team Toronto FC of Major League Soccer (MLS). He was set to join the team upon the completion of the Serie A season in July 2015. He signed a five-year contract with a reported annual salary of $7 million, making him the highest paid player in MLS ahead of Orlando City SC's Kaká, and the highest paid Italian player in all leagues until the arrival of Andrea Pirlo to New York City FC later that year. On 2 February, Juventus announced that Giovinco had left the club five months earlier than originally expected in order to kick-start his career in MLS with Toronto FC. Giovinco made his debut for Toronto FC against Vancouver Whitecaps on 7 March. He provided an assist for Jozy Altidore's equalising goal in the 32nd minute. He scored his first goal for Toronto FC on 4 April, in a 3–2 loss to Chicago Fire, also later setting up Benoît Cheyrou's goal. 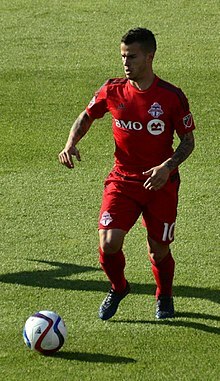 On 13 May, Giovinco scored and assisted a goal in a 3–2 home win over Montreal Impact in the return leg of the 2015 Canadian Championship semi-finals, although Montreal progressed to the final on away goals, having won the home leg 1–0. After setting up two goals in TFC's 3–1 home win over San José on 30 May, Giovinco was voted Major League Soccer Player of the Week by the North American Soccer Reporters, for week 13 of the 2015 MLS season. Following his two goals in Toronto FC's 2–1 away win over D.C. United, he was named MLS Player of the Week for a second consecutive time the following week. On 12 July 2015, Giovinco achieved Toronto FC's first ever hat-trick in MLS play against New York City FC in a 4–4 draw at Yankee Stadium, and set up the fourth goal during the match, also missing a penalty. It was also the third fastest hat trick scored in the league's history at 9 minutes. Following the match, he received the player of the week award for the third time in the 2015 MLS season. After scoring and assisting in a 2–1 home win over Philadelphia Union on 18 July 2015, Giovinco was one of the 22 players to be named to the 2015 MLS All-Star Game roster, although he was later ruled out of the match due to injury, and replaced by his teammate Altidore. On 5 August 2015, Giovinco scored a hat-trick in a 4–1 home win over Orlando City to bring him to the top of the MLS scoring tables with 16 goals, also breaking the club's single-season record of 15 goals set in 2010 by Dwayne De Rosario in the process. On 6 August 2015, he was named the Etihad Airways MLS Player of the Month for July 2015. On 14 August 2015, Giovinco's free kick goal against Orlando City was awarded the MLS Goal of the Week Award. On 29 August 2015, he was substituted in the 51st minute in a 2–1 win over Montreal Impact due to an adductor strain; although it was reported that the injury was not serious, he was ruled out indefinitely. On 3 September 2015, he was named the MLS Player of the Month for August, winning the award for a second consecutive time. He returned to the starting line-up in a 3–1 home defeat to the New England Revolution ten days later. On 26 September, Giovinco broke the MLS record for most combined goals and assists in a single season, previously held by Chris Wondolowski, with his 15th and 16th assists of the season in a 3–2 home win over Chicago, bringing his total tally to 35. Upon review the following day, Jonathan Osorio's goal from a Giovinco "cross" was later credited as Giovinco's goal by the MLS, which meant that he broke another record, by becoming the first player to manage at least 20 goals and 10 assists in a single MLS season, as his 16th assist was changed to his 20th goal. On 14 October, after coming off the bench, he scored the decisive goal in a 2–1 home win over New York Red Bulls, when he started a dribbling run past several players on the left flank, which culminated in a left-footed strike just inside the area; the win allowed Toronto FC to qualify for the MLS playoffs for the first time in their history. This goal was later nominated as a finalist for the MLS Goal of the Year Award, but was beaten out by Krisztián Németh. Several pundits praised his performances, expressing the opinion that this goal was the best goal of the season, and the greatest in Toronto FC's club history. The pundits also praised Giovinco as arguably not only one of the top players of the current MLS season, but also already as one of the greatest players in MLS history. Giovinco had just returned from international duty earlier that day, having appeared for Italy the day before in a Euro 2016 qualifying match in Rome. On 25 October 2015, Giovinco assisted Altidore in a 2–1 away defeat to Montreal in the final match of the regular season, ending the regular season with 22 goals and 16 assists, which allowed him to win the 2015 Audi MLS Golden Boot as both the joint top-scorer (alongside Kei Kamara) and the top-assist provider of the league in his first year with the club, with a record 38 combined goals and assists; as a result, he became the first MLS player ever to win both the top scorer and the top assist provider awards in the same season, as well as the first Italian and Toronto FC player to win these awards. In the playoffs, Toronto FC were eliminated in the knock-out round, following a 3–0 away defeat to domestic rivals Montreal Impact on 29 October. In November 2015, Giovinco was named one of the three finalists for both the 2015 MLS Newcomer of the Year Award and the 2015 MLS MVP Award, winning both awards on 23 November and 2 December respectively, while three days before the latter, on 29 November, he was named to the MLS Best XI. On 30 December, Giovinco was named the "Transaction of the Year" by MLS. Giovinco started off his second season with an 82nd-minute penalty in a 2–0 away win over Supporters' Shield holders New York Red Bulls, on 6 March; he later also set up Marky Delgado's goal in added time. On 16 April, he scored the fastest goal in Toronto FC history at 57 seconds in a 1–0 away win over D.C. United, surpassing the previous record holder Reggie Lambe's by one minute and 50 seconds set in 2012. A week later, he scored both goals in a 2–0 win away to the Montreal Impact in the 401 Derby; with these goals, he equalled De Rosario as the club's all-time top scorer in the MLS with 28 goals in 40 appearances. Giovinco was named to the Team of the Week for his performances. On 7 May, Toronto's home opener, he set up rookie Tsubasa Endoh for his first ever MLS goal in a 1–0 win over FC Dallas, at the newly renovated BMO Field. On 14 May, Giovinco overtook De Rosario as the club's outright all-time top scorer in the MLS, scoring two goals and setting up another in a 4–3 home defeat to Canadian rivals Vancouver. On 29 June, Giovinco helped Toronto FC win the Canadian Championship over Vancouver 2–2 on aggregate, winning on away goals, as he scored the only goal in the first leg on 21 June. On 14 July, he won the 2016 Best MLS Player ESPY Award. In July 2016, Giovinco was included in the roster for the 2016 MLS All-Star Game. After an eight-game goal drought, Giovinco scored a hat-trick against D.C. United, on 23 July, in a 4–1 home win, also surpassing De Rosario's previous all-time record as Toronto FC's top scorer by two goals to 35 goals. With two goals from free kicks during the match, including his seventh in the MLS, he broke David Beckham's record for most goals from set-pieces in the league since 2010. He was named to the Team of the Week once again for his performances, and was also named MLS Player of the Week for the first time that season. On 27 August, Giovinco was brought off the field after the later diagnosis of strains in his quadriceps and adductor in the eventual 1–0 loss in the 401 Derby with Montreal at home; although he was initially expected to be sidelined for a month, the injury was more severe than expected, and he ended up missing seven weeks of play. He finally returned to action on 16 October, against Montreal once again, helping to set up Toronto FC's equaliser in a 2–2 away draw. On 26 October, Giovinco scored the opening goal of a 3–1 home win over Philadelphia, both his and Toronto FC's first MLS Playoff goal in the MLS Cup Playoffs, and was later involved in his team's next two goals; this was Toronto FC's first ever playoff win, which enabled the team to progress to the Eastern Conference Semi-finals for the first time. On 6 November in the second leg of the Eastern Conference Semi-finals, Giovinco scored a hat-trick in a 5–0 away win over New York City FC, 7–0 on aggregate, to progress to the Eastern Conference Finals in an all Canadian derby against Montreal Impact. In the first leg of the Eastern Conference Final on 22 November, Giovinco set up Jozy Altidore's goal in a 3–2 away loss to Montreal. Toronto FC later beat Montreal Impact 5–2 in extra time in the return leg at home on 30 November, as Giovinco once again set up Altidore's goal, winning on an aggregated score of 7–5, making Toronto FC the first Canadian team to compete in an MLS Cup Final; although he was forced off in the 97th minute due to cramp in his calf, he was later declared fit to play against Seattle Sounders in the 2016 MLS Cup Final. On 5 December, he was named to the MLS Best XI for the second season in a row, despite being left off the finalists list for the MLS MVP. In the 2016 MLS Cup Final against Seattle, held at BMO Field on 10 December, Giovinco's performance was largely stifled by Seattle's heavy and aggressive defending, despite initially creating an early goalscoring chance for Altidore; throughout the match, he was fouled a total of six times and had several shots blocked. A scoring opportunity came in the 48th minute, but his shot was skewed wide of the near post. He was eventually substituted for Tosaint Ricketts in the 103rd minute, due to an apparent injury, and consequently, despite being the club's main penalty kick taker, was not used in the resulting shoot-out, which Toronto FC lost 5–4, following a 0–0 draw after extra-time. Regarding Giovinco's substitution, coach Greg Vanney stated in the post-match press conference: "He couldn't move. He looked at me. It's not like I take him off because I want to. I look at him and he gives me the sign that he can’t go any more and when he feels like he can’t go, he feels like he’s more of a liability to the group than anything. That’s the decision. It's not one that I generally want to make, but we had to." The arrival of Spanish playmaker Victor Vázquez in midfield at the beginning of the 2017 season saw less responsibility placed on Giovinco and captain Michael Bradley to create Toronto FC's goalscoring opportunities, and this in turn freed up the Italian, enabling him to focus more on his attacking game. Coach Greg Vanney also switched tactics from a 4–4–2 diamond to a 3–5–2 formation, benefiting Giovinco's and Altidore's attacking partnership by allowing them to play closer together, and with Vázquez supporting them as the team's main creator, the attacking duo began to demonstrate a deeper understanding and an increased awareness of each other's movements, which improved their link-up play, and saw an increase in Altidore's goalscoring output throughout the season. Giovinco scored his first goal of the season in a 2–2 home draw to expansion team Atlanta United, on 8 April 2017. On 27 June, Giovinco scored both goals in a 2–1 home win over Montreal in the 2017 Canadian Championship final second leg — edging Montreal 3–2 on aggregate; he also won the George Gross Memorial Trophy for the most valuable player of the tournament. On 30 July, Giovinco scored two goals and set up another in a 4–0 home win over New York City FC; his second goal of the match, which came from a free kick, was his 50th MLS goal, and his record-breaking 10th MLS goal from a free kick. While Giovinco was ruled out on injury, Toronto FC won the Supporters' Shield for most points in the league that season, following a 4–2 home win over New York Red Bulls on 30 September. In Toronto FC's last match of the regular season on 22 October, Giovinco scored from a free kick on his 100th appearance for the club in a 2–2 away draw to Atlanta; in doing so, Toronto FC broke the MLS regular season point record of 68 points, set by LA Galaxy in 1998, by one point. The goal was also Giovinco's sixth free kick goal of the season, which set the record for most free kicks scored in an MLS regular-season. On 30 October, in the first leg of the Eastern Conference Semi-finals in the 2017 MLS Cup Playoffs, Giovinco scored the match-winning goal from a free kick in a 2–1 away win over New York Red Bulls. Giovinco was subsequently included among the finalists for the 2017 MLS MVP award, after being omitted from the list of finalists for the award the previous season. On 5 November, in the second leg of the Eastern Conference Semi-finals, Giovinco received a booking for dissent in the 80th minute, causing his suspension for the Conference Finals as he also received a yellow in the first leg; Toronto FC lost the match 1–0 at home, but still advanced to the next round on away goals. Giovinco returned to action in the second leg of the Eastern Conference Finals against Columbus Crew on 29 November, at BMO field; he was involved in the only goal of the match, scored by Altidore, which saw Toronto win the Eastern Conference for the second consecutive year, and earn a place in the 2017 MLS Cup Final. On 30 November, Giovinco was named to the MLS Best XI for the third season in a row. On 9 December, in a rematch of the previous year's final at BMO field, Toronto defeated Seattle 2–0 in the 2017 MLS Cup, and became the first MLS team to complete a domestic treble with their victory, as well as the first Canadian team to win the MLS Cup; Giovinco was involved in both goals, and gave the final pass to goalscorer Altidore for the opener. On 20 February 2018, Giovinco opened the season with his first appearance in the CONCACAF Champions League, the first leg of a round of 16 match-up away to the Colorado Rapids, where he set up Jonathan Osorio's opening goal before later adding one himself for a 2–0 win. On 7 March, in the first leg of the CONCACAF Champions League quarter-finals, Giovinco set up Jonathan Osorio in the last minute of regulation time to give Toronto FC a 2–1 home win against Mexican side Tigres UANL. In the second leg, held on 13 March, Giovinco was involved in both of his team's goals in an eventual 3–2 away defeat, helping to create an own goal and later scoring another himself from a free kick; the result enabled Toronto FC to progress to the semi-finals of the competition for only the second time in their history, on away goals, following a 4–4 draw on aggregate. On 3 April, Giovinco scored the opening goal from the penalty spot in a 3–1 home win over Club América in the first leg of the semi-final, later setting up Toronto FC's goal in the 1–1 away draw at the Estadio Azteca in the second leg on 10 April, to advance 4–2 on aggregate to the finals. After a 2–1 home loss to Guadalajara on 17 April in the first leg of the finals, Giovinco scored the aggregate-equalising goal in 2–1 away win to Guadalajara in the return leg on 25 April, which took the match straight to penalty shoot-out; Giovinco scored Toronto FC's first penalty but eventually lost the Champions League final 4–2 in a penalty shoot-out. Giovinco won the Golden Ball as the tournament's best player; he was directly involved in 11 of the 13 goals that Toronto FC scored in the competition, and notched four goals and three assists in eight appearances, which also made him the joint top-scorer of the tournament alongside teammate and Golden Boot winner Jonathan Osorio. On 16 May, Giovinco was fined an undisclosed amount by the MLS Disciplinary Committee for failing to leave the field in a timely and orderly manner after receiving a red card in a league loss away to the New England Revolution on 12 May. On 15 August, Giovinco scored a goal and assisted two more in a 5–2 home win over Vancouver Whitecaps to win the 2018 Canadian Championship 7–4 on aggregate. Reigning MLS Cup champions Toronto FC failed to qualify for the playoffs after a 2–1 home loss against the Vancouver Whitecaps on October 6, 2018, with three games left to play in the season. Giovinco finished the 2018 MLS campaign with a goal in a 4–1 home win over Atlanta in the final match of the regular season on 28 October. "As I have always maintained, I was hoping to renew my contract and finish my playing career in a city that feels like home... Unfortunately, this desire of ours has clashed with a change in direction with current TFC management. For the two years I have been seeking to extend my contract however management was reluctant... They may say I left for a more lucrative deal, but this is not the case... After having grown the brand and elevating the overall reputation of TFC both at home and abroad, it seems I no longer serve a purpose. I would have accepted less to stay in Toronto. Therefore, I reluctantly announce that my tenure as a TFC player has come to an end... With me I bring beautiful memories. Toronto – the 6ix – you are and will always remain in my heart. Thank you for everything you have taught me about myself and about life. I love you Toronto!" Giovinco playing for Al-Hilal during the 2019 AFC Champions League against Esteghlal. On 30 January 2019, Toronto FC sold Giovinco to Saudi Arabian club Al-Hilal FC for an undisclosed fee. On 12 February 2019, Giovinco scored on his debut with the club, his club's third goal of a 4–1 home win over Al-Qadsiah. Giovinco has represented Italy at every youth level from the under-16 level onwards. He was called up to Italy under-21 by head coach Pierluigi Casiraghi to make his U-21 debut in the 2009 European Championship opening qualifier on 1 June 2007 and helped in their 4–0 defeat of Albania. Giovinco (furthest right) lining up at the 2008 Toulon Tournament. He also played at the 2008 Toulon Tournament, where he appeared in all five matches, and was voted the most valuable player of the competition, scoring two goals in the opening game against the Ivory Coast, and netting the winning penalty in the semi-final shoot-out against Japan. Italy ultimately won the competition, defeating Chile 1–0 in the final. That summer, he and Juventus teammates Claudio Marchisio and Paolo De Ceglie were named in the squad for the 2008 Summer Olympics in Beijing, China. On 7 August 2008, he scored the opening goal in a 3–0 win against Honduras in the first match of the competition where he struck the ball from outside of the box with his weaker left foot; Italy were eliminated in the quarter-finals of the competition, following a 3–2 loss to Belgium on 16 August. In the summer of 2009, Giovinco was called up to the U-21 side for the European Championships in Sweden after playing a part in their successful qualifying campaign. Giovinco started in every single match at the tournament, but Italy lost to eventual winners Germany 1–0 in a tightly contested semi-final. Due to his performances throughout the European Championship, he was named to the Team of the Tournament, and was also included in the list of the top ten players of the competition. Giovinco was called up for International duty for the first time in nearly two years while on loan at Parma, earning his first senior call-up for Italy on 6 February 2011; he made his Italy senior team debut on 9 February, in a friendly match against Germany in Dortmund, which ended in a 1–1 draw, coming on as a second half substitute for Stefano Mauri. In his second international appearance, against Ukraine, he provided an assist from a back-heel for Alessandro Matri's goal as Italy won the match 2–0 in Kiev. After some promising substitute appearances, manager Cesare Prandelli stated that he would give Giovinco his full international debut as a starter alongside Antonio Cassano, which came later that year on 11 October, in a 3–0 home win over Northern Ireland in a European qualifier. Giovinco playing for Italy in 2012. Giovinco was named part of Italy's 23-man squad for UEFA Euro 2012. Giovinco appeared as a substitute in the two opening group matches of the tournament against Spain and Croatia, almost assisting a goal against Spain in the opening match, as the earlier goalscorer Antonio Di Natale put his lobbed pass over the bar. Italy finished as runners up to Spain in the final in a 4–0 loss. Giovinco started in the first game of Italy's 2014 World Cup Qualification campaign against Bulgaria in Sofia, wearing the jersey number 10; the match ended in a 2–2 draw. He scored his first goal for Italy in the 2013 FIFA Confederations Cup group stage match against Japan, wearing the number 10 shirt; in addition to scoring the match-winning goal, he also helped to win a penalty, which was converted by Mario Balotelli, and thus ensured a 4–3 win, which allowed Italy to progress to the semi-finals of the competition for the first time in their history. In the semi-finals, Giovinco came on during the second half of extra time; the match ended 0–0 and went to penalties as Giovinco netted his penalty for Italy, however, Spain won 7–6 due to Leonardo Bonucci's miss. Italy subsequently won the bronze medal match against Uruguay, also on penalties, after the match had ended 2–2 after extra time. Due to the lack of playing time during the 2013–14 season, Giovinco missed out on the 2014 World Cup and was not named in the provisional nor the final squad. In October 2014, Giovinco was called up by the new Italy manager, and his former Juventus manager, Antonio Conte, for an UEFA Euro 2016 qualifying match against Azerbaijan in Palermo, which Italy won 2–1 on 10 October. Giovinco came on during the second half, and he helped set up Giorgio Chiellini's second, match-winning goal, also hitting the cross-bar towards the end of the match, from a strike outside the area, after an individual dribbling run. Following his strong performances for MLS side Toronto FC, Giovinco was called up to the national team once again in August 2015 for Italy's Euro 2016 qualifying matches against Malta and Bulgaria in September, and was set to become the first MLS player to represent Italy. He was ultimately ruled out of both matches after sustaining an adductor injury against Montreal Impact, and New York City FC's Andrea Pirlo became the first MLS player to play for Italy, during the same qualifiers. In October 2015, he was named to the Italian national team for the UEFA Euro 2016 qualifiers against Azerbaijan and Norway on 10 and 13 October. He made a substitute appearance in Italy's 3–1 away win over Azerbaijan, which guaranteed the Italians a place at Euro 2016; he came on in the 79th minute and later hit the cross-bar from a free kick after being fouled by Badavi Guseynov, who was subsequently sent off. On 13 October, he came off of the bench once again and was involved in both goals as Italy came from behind to defeat Norway 2–1 in Rome, and top their group. On 23 May 2016, Giovinco, along with fellow MLS compatriot Pirlo, was left off of Conte's 30-player shortlist for Italy's Euro 2016 squad. Regarding their omission, Conte commented in a press conference, "When you make a certain choice and go to play in certain leagues, you do so taking it into account that they could pay the consequences from a footballing viewpoint". In response to his omission, Giovinco stated, "I was upset. I need to keep improving so I can find my place back on the national team; I've said before, the league is continuing to grow and it's a beautiful league." Under Conte's successor, Gian Piero Ventura, Giovinco was once again omitted from Italy's team, both for the 2018 World Cup qualifiers and for friendlies, in spite of his club form for Toronto FC in the MLS; when asked about the omissions of Giovinco and Domenico Criscito from his squad, Ventura commented: "Giovinco is a different story. I have done everything to help him but the reality is that he plays in a league [the MLS] that doesn't count for much, and the number of goals he scores is less important because with the quality he has got, he is bound to make a difference in that league. The problem is that if you play in that type of league, and you get used to playing in that type of league, it becomes a problem of mentality. Criscito, on the other hand, is a great player, I've seen him grow. The problem is that he has to fight to rediscover his spark and he needs that because he is just a little behind. The problem with Giovinco is the same. How long would it take to get him to show that spark?" Italy failed to qualify for the World Cup for the first time in 60 years, with Giovinco's agent claiming that the team should have selected him. On 5 October 2018, Giovinco was called up, for the first time in three years, by new manager Roberto Mancini for a friendly match on 10 October against Ukraine and a UEFA Nations League match against Poland on 14 October, however, he was an unused substitute for both matches. Giovinco with Juventus in 2012. Giovinco is a small, quick, technically gifted, and agile player, with noted dribbling skills, balance, acceleration, and excellent ball control; these characteristics allow him to beat opponents, hold up the ball with his back to goal or in tight spaces, and create space for teammates, despite his lack of strong physical attributes. Although he is capable of scoring goals, he is also adept creating chances for his teammates, possessing good link-up play as well as notable playmaking skills, and he is known for his vision, creativity, and his passing and striking ability with both feet, despite being naturally right footed. Furthermore, he is highly regarded for his accuracy and ball delivery from free kicks, and is considered to be a set piece specialist in the media, as several of his goals have come from dead ball situations; he is also effective at scoring from penalties. A versatile attacker, Giovinco is capable of playing in several offensive positions, and he is usually deployed in a free role as a second striker, behind or off of another forward, although he is also capable of playing as a winger, on either flank, or in a deeper playmaking role in the centre of the pitch, as a creative attacking midfielder; he has also been used in a more offensive, central role, as a main striker, or even as a false 9. In May 2013, Sebastian and his partner Sharj Milano celebrated the birth of their first child, Jacopo; the couple have been in a relationship since 2007. Their daughter Alma was born in August 2016. Giovinco features in EA Sports' FIFA video game series; he appeared on the cover of the MLS custom edition of FIFA 16. As of match played on 29 March 2019. ^ a b c d Appearances in the UEFA Champions League. ^ Appearance in the Supercoppa Italiana. ^ Appearances in the UEFA Champions League and UEFA Europa League. ^ a b c Appearances in the MLS Cup playoffs. ^ Appearances in the CONCACAF Champions League. ^ Appearances in the Campeones Cup. ^ a b c "Giovinco, Juve's atomic ant". fifa.com. 26 February 2009. ^ a b c d e f g h i j Stefano Bedeschi (26 January 2011). "Gli eroi in bianconero: Sebastian GIOVINCO" (in Italian). Tutto Juve. Retrieved 9 July 2015. ^ "The 100 best footballers in the world 2015 – interactive". The Guardian. 21 December 2015. Retrieved 7 January 2016. ^ "FourFourTwo's Best 100 Football Players in the World 2015: 100-91". FourFourTwo. 30 November 2015. Retrieved 7 January 2016. ^ "Barcelona dominate L'Equipe's Top 100 Players of 2015". La Gazzetta dello Sport. 3 January 2016. Retrieved 7 January 2016. ^ "Sebastian Giovinco Complete Interview". J1897.com. 1 April 2007. Archived from the original on 6 January 2009. Retrieved 15 September 2007. ^ Francesco Cherchi (19 March 2009). "SEBASTIAN GIOVINCO: "Chiamatemi Formica, ma io punto allo scudetto"" (in Italian). Tutto Juve. Retrieved 22 September 2015. ^ "58° TORNEO INT.LE GIOVANILE DI VIAREGGIO COPPA CARNEVALE 2006". Archived from the original on 22 July 2011. ^ "Juventus, 3-1 al Bologna e la serie A è più vicina" (in Italian). La Repubblica. 12 May 2007. Retrieved 3 November 2016. ^ "Marchisio diventa grande, La Juve gli consegna le chiavi" (in Italian). Gazzetta dello Sport. 28 June 2009. ^ "La Juve punta sui giovani d'oro" (in Italian). Tuttosport. 14 December 2008. Archived from the original on 18 December 2008. ^ "Juventus promoted back to Serie A in style". espnfc.us. 19 May 2007. Retrieved 3 November 2016. ^ "Habemus Sebastian" (in Italian). Il Tirreno. 5 July 2007. Retrieved 3 November 2016. ^ "La Fiorentina cala il tridente debutto e vittoria nel derby" (in Italian). La Repubblica. 26 August 2007. Retrieved 3 November 2016. ^ "Entra Giovinco, l'Empoli va. Palermo, sfuma il 2º posto" (in Italian). La Gazzetta dello Sport. 30 September 2007. Retrieved 3 November 2016. ^ "L'Empoli travolto a Zurigo" (in Italian). Il Sole 24 ORE. 4 October 2007. Archived from the original on 20 July 2012. Retrieved 3 November 2016. ^ "UFFICIALE: Giovinco torna alla Juve" (in Italian). Tuttomercatoweb.com. 26 June 2008. Retrieved 3 November 2016. ^ "Giovinco nears new Juve deal". 10 October 2008. Retrieved 3 November 2016. ^ "Giovinco, La pennellata degna di Del Piero" (in Italian). Il Giornale. 8 December 2008. ^ Paolo Bandini (16 March 2009). "Giovinco rises above the rancour to lift Juve's mood". The Guardian. Retrieved 22 October 2017. ^ a b c d e f g h i j k "S. Giovinco". Soccerway.com. Perform Group. Retrieved 18 July 2015. ^ "Giovinco: "Visto? Sono uno vero, con me vi divertirete!"" (in Italian). Tuttosport. 30 October 2009. Archived from the original on 2 November 2009. ^ "Sebastian Giovinco: A Primer". juvefc.com. 19 January 2015. Retrieved 3 November 2016. ^ "Giovinco to miss rest of the season". juventus.com. 13 April 2010. Archived from the original on 17 April 2010. ^ "Giovinco al Parma. Stasera la presentazione" (in Italian). Parma FC. 5 August 2010. Archived from the original on 7 October 2010. Retrieved 5 August 2010. ^ "Parma announce Giovinco deal". ESPN Soccernet. 5 August 2011. Retrieved 5 August 2010. ^ "Giovinco illumina il Parma, Brescia ko" (in Italian). eurosport.yahoo.it. Retrieved 3 November 2016. ^ "Le pagelle di Parma-Brescia: Giovinco è un gigante" (in Italian). sport.sky.it. Retrieved 3 November 2016. ^ "Il Catania batte un Parma molto sfortunato" (in Italian). eurosport.yahoo.it. Retrieved 3 November 2016. ^ "Passo falso nel 2011" (in Italian). juventus.it. 6 January 2011. Archived from the original on 10 January 2011. Retrieved 3 November 2016. ^ a b "La Formica diventa gigante. Campionato da 15 reti e 10 assist: voto 10 e lode" (in Italian). TuttoMercatoWeb.com. 22 May 2012. Retrieved 4 November 2016. ^ "Giovinco, il "piccolo" che ringrazia Guardiola" (in Italian). La Repubblica. 6 June 2011. Retrieved 4 November 2016. ^ "Barca serious about Giovinco". Football Italia. 5 April 2012. Retrieved 17 May 2012. ^ "Siena 0 - 2 Parma". Football-Italia.net. Football Italia. 6 May 2012. Retrieved 3 November 2016. ^ a b "TFC Player Profile: Sebastian Giovinco". Toronto FC.ca. Retrieved 9 July 2015. ^ Daniella Matar (23 August 2012). "Serie A champion Juventus set to start title defence against Parma after troubled off-season". The Huffington Post. Retrieved 4 November 2016. ^ "Giovinco returns to Juventus". Juventus FC. 21 June 2012. Retrieved 21 June 2012. ^ "I would like to have the No.10 shirt, says Giovinco". goal.com. Retrieved 31 August 2012. ^ "Supercoppa alla Juve, Napoli battuto 4-2" (in Italian). Ansa.it. 11 August 2012. Retrieved 3 November 2016. ^ "Juventus vs Parma – 2–0". Football Italia. Retrieved 31 August 2012. ^ "Udinese 1–4 Juventus: Giovinco double helps sink 10-man hosts". yahoo.com. Retrieved 2 September 2012. ^ "Juventus vs FC Nordsjaelland". goal.com. Retrieved 6 December 2012. ^ "Juventus vs. Chelsea: 3–0". BBC.co.uk. Retrieved 6 December 2012. ^ "Shaktar Donetsk vs Juventus: 0–1". yahoo.com. Retrieved 6 December 2012. ^ "Marchisio stars in Juve win". skysports.com. 1 December 2016. Retrieved 23 November 2016. ^ Ivan Palumbo (12 December 2012). "Pasticcio sardo, segna Giovinco FINALE Coppa Italia, Juve-Cagliari 1–0" (in Italian). La Gazzetta dello Sport. Retrieved 12 December 2012. ^ "Juventus-Milan/ Giovinco come Levratto, l'Avvocato Sportivo: la rete bucata? Gol regolare ma... (esclusiva)" (in Italian). 7 October 2013. Retrieved 21 January 2015. ^ "Udinese-Juventus 0–2. Gol di Giovinco e Llorente. Capolista a +8 sulla Roma" (in Italian). La Gazzetta dello Sport. 14 April 2014. Retrieved 21 January 2015. ^ "Giovinco: 'Italy needed Conte'". Football Italia. 10 October 2014. Retrieved 4 November 2016. ^ "Juventus's Sebastian Giovinco stars in cup drubbing of Verona". The Guardian. 15 January 2015. Retrieved 21 January 2015. ^ "Sebastian Giovinco: Toronto FC sign Juventus striker". BBC Sport. 19 January 2015. Retrieved 20 January 2015. ^ "Italy attacker Sebastian Giovinco to join Toronto FC in July". espnfc.com. ESPN. 19 January 2015. Retrieved 19 January 2015. ^ Daniel Prescott (7 July 2015). "Andrea Pirlo becomes the highest paid MLS player with an $8m salary... more than Frank Lampard, Steven Gerrard and David Villa". dailymail.co.uk. dailymail. Retrieved 4 October 2015. ^ "Giovinco to join Toronto from Juventus". UEFA.com. 19 January 2015. Retrieved 21 January 2015. ^ "Sebastian Giovinco for Toronto FC early". Juventus.com. 2 February 2015. ^ "Vancouver Whitecaps 1, Toronto FC 3 – MLS Match Recap". mlssoccer.com. 7 March 2015. ^ Israel Fehr (4 April 2015). "Sebastian Giovinco scores first goal for Toronto FC in 3–2 loss to Fire". yahoo.com. Retrieved 6 April 2015. ^ "Impact advance over Toronto FC in Canadian Championship". CBC Sports. 13 May 2015. Retrieved 30 October 2015. ^ "Sebastian Giovinco named MLS Player Of The Week". Toronto FC. 2 June 2015. Retrieved 3 June 2015. ^ "Toronto FC forward Sebastian Giovinco takes MLS honour for second straight week". The Toronto Star. 9 June 2015. Retrieved 10 June 2015. ^ Armen Bedakian (12 July 2015). "Toronto FC's Greg Vanney stunned after Sebastian Giovinco hat trick in "crazy, hectic" draw". MLS Soccer. Retrieved 31 December 2015. ^ "Toronto FC's Sebastian Giovinco wins third MLS Player of the Week award after hat trick vs. NYCFC". MLS Soccer. 14 July 2015. Retrieved 14 July 2015. ^ "Sebastian Giovinco leads Toronto FC to win over Union". ESPN FC. 18 July 2015. Retrieved 18 July 2015. ^ "Sebastian Giovinco, Kei Kamara among 22 players named to 2015 AT&T MLS All-Star Game roster". MLS. 18 July 2015. Retrieved 18 July 2015. ^ "Toronto FC's Sebastian Giovinco ruled out of All-Star Game by injury, replaced by teammate Jozy Altidore". MLS. 29 July 2015. Retrieved 30 July 2015. ^ a b Neil Davidson (5 August 2015). "Giovinco hat trick puts TFC over Orlando". TSN. Retrieved 6 August 2015. ^ "Toronto FC attacker Sebastian Giovinco wins Etihad Airways Player of the Month award for July". MLS Soccer. 6 August 2015. Retrieved 2 September 2015. ^ "Toronto FC star Sebastian Giovinco wins AT&T Goal of the Week honors for the first time". MLS Soccer. 14 August 2015. Retrieved 24 August 2015. ^ James Grossi (2 September 2015). "Toronto FC disappointed to see Sebastian Giovinco injured but contend: "Sometimes injuries are hidden gems"". MLS Soccer. Retrieved 2 September 2015. ^ "TFC's Giovinco named player of the month". TSN. 4 September 2015. Retrieved 3 September 2015. ^ James Grossi (13 September 2015). "Match Recap: TFC 1, New England 3". Toronto F.C. Retrieved 13 September 2015. ^ a b Matthew Doyle (26 September 2015). "Sebastian Giovinco sets single-season record for combined goals & assists – Armchair Analyst". MLS Soccer. Retrieved 27 September 2015. ^ a b Peter Galindo (27 September 2015). "Giovinco awarded 20th goal, makes MLS history". Sportsnet. Retrieved 27 September 2015. ^ a b Ben Estes (14 October 2015). "Giovinco's incredible goal clinches Toronto FC's first-ever playoff berth". Sports Illustrated. Retrieved 15 October 2015. ^ "Sporting KC's Krisztian Nemeth wins 2015 AT&T Goal of the Year". MLSsoccer.com. 3 December 2015. ^ Ben Kenyon (15 October 2015). "Sebastian Giovinco scored this stunning goal for Toronto 24 hours after playing for Italy". Retrieved 15 October 2015. ^ Andrew Jones (14 October 2015). "Sebastian Giovinco beat the entire defense for a goal and that wasn't the most impressive part". SB Nation. Retrieved 15 October 2015. ^ "Giovinco the best MLS player ever?". ESPN FC. 6 August 2015. Retrieved 15 October 2015. ^ Olivier Tremblay (25 October 2015). "Montreal Impact 2, Toronto FC 1 – MLS Match Recap". MLS Soccer. Retrieved 26 October 2015. ^ a b "Toronto FC's Sebastian Giovinco wins 2015 Audi Golden Boot". MLS Soccer. 25 October 2015. Retrieved 26 October 2015. ^ a b "By Season". MLS Soccer. Retrieved 26 October 2015. ^ "Sebastian Giovinco wins Golden Boot, is first to lead MLS in goals, assists". Sports Illustrated. 25 October 2015. Retrieved 27 October 2015. ^ Sean Gordon (29 October 2015). "Toronto FC falls to Montreal Impact in first all-Canadian MLS playoff". The Globe and Mail. Retrieved 30 October 2015. ^ "Benny Feilhaber, Sebastian Giovinco, Kei Kamara contend for Landon Donovan MVP as MLS announces 2015 Awards finalists". MLS Soccer. 3 November 2015. Retrieved 3 November 2015. ^ a b "2015 MLS Newcomer of the Year: Sebastian Giovinco". MLS Soccer. 23 November 2015. Retrieved 23 November 2015. ^ a b John Molinaro (2 December 2015). "TFC's Giovinco named Major League Soccer MVP". Sportsnet.ca. Retrieved 2 December 2015. ^ "2015 MLS Best XI revealed: 10 first-time selections get the nod". Major League Soccer. Retrieved 29 November 2015. ^ "Best Of MLS 2015: Sebastian Giovinco to Toronto FC is the Transaction of the Year". MLS Soccer. 30 December 2015. Retrieved 31 December 2015. ^ "Late Giovinco Goal Gives Toronto FC Opening Day Win Over New York Red Bulls". SB Nation. 6 March 2016. Retrieved 6 March 2016. ^ a b Armen Bedakian (16 April 2016). "Giovinco scores fastest goal in club history as Toronto FC defeats D.C. United". thescore.com. Retrieved 16 April 2016. ^ Beacon, Bill (23 April 2016). "Sebastian Giovinco leads TFC past Impact". CBC. Retrieved 23 April 2016. ^ a b Nicholas Rosano (23 April 2016). "Montreal Impact 0, Toronto FC 2". MLSSoccer.com. Retrieved 27 April 2016. ^ Benjamin Baer (25 April 2016). "2016 Team of the Week (Wk 8): Toronto FC beat up on rivals in 401 Derby". MLSSoccer.com. Retrieved 2 May 2016. ^ Neil Davidson (8 May 2016). "Sebastian Giovinco razor-sharp in Toronto FC home opener in new-look BMO Field". Yahoo.com. Archived from the original on 12 May 2016. Retrieved 9 May 2016. ^ a b John Molinaro (14 May 2016). "Giovinco's record-setting night overshadowed by 'pathetic' TFC". Sportsnet.ca. Retrieved 16 May 2016. ^ a b "TFC loses to Whitecaps, but wins Voyageurs Cup". sportsnet.ca. 30 June 2016. Retrieved 30 June 2016. ^ a b "Sebastian Giovinco Wins ESPY Award For Best 2016 MLS Player". SBNATION. 14 July 2016. Retrieved 14 July 2016. ^ a b JOHN MOLINARO (23 July 2016). "Giovinco's masterclass performance lifts Toronto FC past D.C. United". sportsnet.ca. Retrieved 23 July 2016. ^ Benjamin Baer (25 July 2016). "Free Kick King! Giovinco's seventh free-kick goal is most since 2010". MLS Soccer. Retrieved 27 July 2016. ^ "Team of the Week (Wk 20)". 25 July 2016. Retrieved 25 July 2016. ^ "TFC's Giovinco named player of week". TSN.ca. 26 July 2016. Retrieved 28 July 2016. ^ "Toronto FC forward Sebastian Giovinco out for a month with double strain". espnfc.com. 29 August 2016. Retrieved 29 August 2016. ^ Kelsey Patterson (16 October 2016). "Sebastian Giovinco helps lead Toronto again in first game back from injury". MLSSoccer.com. Retrieved 23 October 2016. ^ "Giovinco leads Toronto FC to first-ever playoff win". tsn.ca. 26 October 2016. Retrieved 26 October 2016. ^ "Giovinco propels TFC to all-Canadian Eastern final". CBC.ca. 6 November 2016. Retrieved 6 November 2016. ^ "Montreal Impact fend off Toronto FC rally in East Conference finals". ESPN FC. 22 November 2016. Retrieved 23 November 2016. ^ "Toronto FC 5, Montreal Impact 2 2016 MLS Cup Playoffs Recap". mlssoccer.com. 30 November 2016. Retrieved 30 November 2016. ^ Ben Couch (30 November 2016). "Toronto FC 5, Montreal Impact 2 – 2016 MLS Cup Playoffs Recap". MLSSoccer.com. Retrieved 10 December 2016. ^ Arch Bell (8 December 2016). "Toronto vs. Seattle: Everything you need to know about MLS Cup". ESPN FC. Retrieved 10 November 2016. ^ a b "Toronto FC's Sebastian Giovinco among MLS Best XI despite MVP snub". ESPN FC. 5 December 2016. Retrieved 7 December 2016. ^ a b Kristina Rutherford (9 September 2017). "Big Read: Why Victor Vazquez is like no player in Toronto FC history". www.sportsnet.ca. Retrieved 1 November 2017. ^ John Molinaro (3 May 2017). "Altidore, Giovinco making magic up front together for TFC". www.sportsnet.ca. Retrieved 1 November 2017. ^ Sebastian Giovinco (5 October 2017). "Sebastian Giovinco on his love for Toronto FC, growing up in Turin and Juventus". www.skysports.com. Retrieved 2 November 2017. ^ "Giovinco scores first goal as TFC held to draw by Atlanta". sportsnet.ca. 8 April 2016. Retrieved 8 April 2017. ^ a b c "Toronto FC repeat as Canadian Champions; earn berth in CONCACAF Champions League". canadasoccer.com. 27 June 2017. Retrieved 27 June 2017. ^ "GOAL: Sebastian Giovinco's stunning free kick marks his 50th MLS goal". mlssoccer.com. 30 July 2017. ^ "Sebastian Giovinco 'maybe the best that has ever played' in MLS - Greg Vanney". ESPN FC. 31 July 2017. Retrieved 31 July 2017. ^ Alicia Rodriguez (30 July 2017). "Sebastian Giovinco breaks MLS free kick record with 10th set-piece goal". www.mlssoccer.com. Retrieved 31 July 2017. ^ a b "Kings of the League: Toronto FC win first Supporters' Shield". mlssoccer.com. 30 September 2017. ^ "TFC breaks MLS record for points in a season with draw against Atlanta". sportsnet.ca. 22 October 2017. ^ a b Rudi Schuller (22 October 2017). "Sebastian Giovinco drinks beer, scores world-class goal". www.sportingnews.com. Retrieved 31 October 2017. ^ Graham Parker (30 October 2017). "Giovinco magic proves to be the difference as Toronto beats Red Bulls". ESPN FC. Retrieved 31 October 2017. ^ "Sebastian Giovinco finalist for MLS MVP after last year's omission". ESPN FC. 31 October 2017. Retrieved 1 November 2017. ^ Brian Straus (5 November 2017). "Toronto FC Moves on to Eastern Conference Final After Heated Game Against Red Bulls". Sports Illustrated. Retrieved 5 November 2017. ^ a b "Toronto FC 1, Columbus Crew SC 0". mlssocer.com. 29 November 2017. ^ Cathal Kelly (29 November 2017). "Jozy Altidore goes from good to legendary with Toronto FC". The Globe and Mail. Retrieved 29 November 2017. ^ a b "2017 MLS Best XI revealed: Who was the best in 2017?". MLSSoccer.com. 30 November 2017. ^ Charles Boehm (20 February 2018). "Colorado Rapids 0, Toronto FC 2 - CCL Round of 16 Recap". www.mlssoccer.com. Retrieved 21 February 2018. ^ John Molinaro (12 March 2018). "Sublime moments of skill could be difference for TFC vs. Tigres". Sportsnet. Retrieved 14 March 2018. ^ Phil West (13 March 2018). "Tigres UANL 3, Toronto FC 2 – 2018 CCL Quarterfinals Recap". MLS Soccer. Retrieved 14 March 2018. ^ Charles Boehm (3 April 2018). "Toronto FC 3, Club America 1 – CCL Semifinals Recap". Toronto FC. Retrieved 29 July 2018. ^ "Toronto FC advances to CONCACAF Champions League final with 1-1 draw against Club America". thestar.com. 11 April 2018. ^ "CD Guadalajara 1, Toronto FC 2 | 2018 Concacaf Champions League Recap". mlssoccer.com. 25 April 2018. ^ a b "Toronto FC's Giovinco wins CCL Golden Ball award; Osorio wins Golden Boot". mlssoccer.com. 26 April 2018. ^ "Golden Ball". CONCACAF Champions League. 26 April 2018. Retrieved 30 July 2018. ^ John Molinaro (1 June 2018). "Toronto FC's Giovinco confident more goals are coming". Sportsnet. Retrieved 30 July 2018. ^ "Giovinco fined for not leaving field in timely manner after red card vs. Revolution". thescore.com. 16 May 2018. ^ a b "Toronto FC 5, Vancouver Whitecaps 2 2018 Canadian Championship Recap". torontofc.ca. 15 August 2018. ^ a b Neil Davidson (15 August 2018). "Altidore hits hat trick as TFC thump Vancouver to win Canadian Championship". CTV News. Retrieved 15 August 2018. ^ "Toronto FC eliminated from MLS playoff contention". thestar.com. 6 October 2018. ^ Laura Armstrong (28 October 2018). "Toronto FC wraps up lost season with win over Atlanta United". The Toronto Star. Retrieved 28 October 2018. ^ "Sebastian Giovinco: 'I would have accepted less to stay in Toronto'". sportsnet.ca. 31 January 2019. Retrieved 31 January 2019. ^ "'I WANTED IT TO END DIFFERENTLY': Sebastian Giovinco leaves TFC". torontosun.com. 31 January 2019. Retrieved 31 January 2019. ^ "Sebastian Giovinco sold to Al-Hilal FC". torontofc.ca. 30 January 2019. ^ "Toronto FC's Sebastian Giovinco joins Al-Hilal, slams former club in exit". ESPN. Retrieved 30 January 2019. ^ "Former TFC striker Giovinco scores in debut for new Saudi club". sportsnet.ca. 12 February 2019. ^ "La nuova Under 21 parte in quarta vittoria sonante contro gli albanesi" (in Italian). La Repubblica. 1 June 2007. Retrieved 6 October 2017. ^ "Honduras - Italy". fifa.com. 7 August 2008. Retrieved 3 November 2016. ^ "Italy-Belgium 2-3". FIFA.com. Retrieved 26 November 2017. ^ "Under21: i convocati di Casiraghi per l'Europeo" (in Italian). Corriere dello Sport. 4 June 2009. Archived from the original on 1 August 2012. Retrieved 3 November 2016. ^ a b "Germany set up rematch". Sky Sports. 26 June 2009. Retrieved 11 May 2015. ^ "Alla Germania basta un solo tiro per mandare a casa la giovane Italia" (in Italian). Il Giornale. 27 June 2009. Retrieved 6 October 2017. ^ "Motta, Giovinco e Matri le novità. Tra i 23 azzurri il ritorno di Buffon" (in Italian). FIGC. 6 February 2011. Retrieved 6 October 2017. ^ Riccardo Pratesi (11 May 2015). "Rossi salva una buona Italia In Germania finisce 1–1" [Rossi saves a promising Italy side In Germany it ends 1–1] (in Italian). La Gazzetta dello Sport. Retrieved 9 February 2011. ^ "Rossi-Matri, Italy wins in Ukraine. Prandelli: "Lucid and orderly"". FIGC. 29 March 2011. Retrieved 11 May 2015. ^ "Pint-sized Giovinco set for full Italy debut". www.google.com. 10 October 2011. ^ "Cassano si prende l'Italia, Irlanda del Nord al tappeto 3-0" (in Italian). Sky.it. 11 October 2011. Retrieved 6 October 2017. ^ "Trentadue Azzurri selezionati da Prandelli: molte le novità" (in Italian). Figc.it. Retrieved 3 November 2016. ^ "Consegnata all'UEFA la lista dei 23 giocatori convocati per gli Europei" (in Italian). figc.it. Archived from the original on 24 September 2015. Retrieved 3 November 2016. ^ Ben Smith (10 June 2012). "Euro 2012: Spain 1–1 Italy". BBC Sport. Retrieved 11 May 2015. ^ Jonathan Jurejko (14 June 2012). "Italy 1–1 Croatia". BBC Sport. Retrieved 11 May 2015. ^ Phil McNulty (1 July 2012). "Spain 4 – 0 Italy". BBC Sport. Retrieved 11 May 2015. ^ ""Voglio la maglia numero dieci" In azzurro Giovinco si sente grande". La Stampa. 7 September 2012. Retrieved 3 November 2016. ^ "Bulgaria 2–2 Italy: Osvaldo double not enough for lacklustre Azzurri". Goal.com. Retrieved 9 September 2012. ^ "Italy's victory over Japan puts them into Confederations Cup semi-finals". The Guardian. 20 June 2013. Retrieved 20 June 2013. ^ "Azzurri win seven-goal Japan thriller!". Football Italia. 20 June 2013. Retrieved 6 October 2017. ^ "Spain edge dramatic shootout to reach Final". FIFA. 27 June 2013. Archived from the original on 5 August 2013. Retrieved 11 May 2015. ^ a b "Buffon stars as Italy win shootout & bronze". FIFA. 30 June 2013. Archived from the original on 9 July 2014. Retrieved 11 May 2015. ^ "Rossi, Immobile make Italy provisional squad". fifa.com. 13 May 2014. Archived from the original on 13 October 2014. ^ "Italy squad to face Azerbaijan & Malta". italianfootballdaily.com. 4 October 2014. Retrieved 22 November 2016. ^ "Italia-Azerbaigian 2–1. Fa tutto Chiellini: due reti e un autogol" (in Italian). Il Corriere della Sera. 10 October 2014. Retrieved 27 January 2015. ^ "It's official: Sebastian Giovinco, Andrea Pirlo called up for Italian national team UEFA Euro 2016 qualifiers". mlssoccer.com. 29 August 2015. Retrieved 22 November 2016. ^ "Toronto FC's Sebastian Giovinco ruled out of Italy's Euro 2016 qualifiers this week due to adductor injury". MLS Soccer. 31 August 2015. Retrieved 2 September 2015. ^ "Giovinco called up by Italy for Euro qualifiers". TSN. 3 October 2015. ^ "Azerbaijan 1 Italy 3". BBC Sport. 10 October 2015. Retrieved 11 October 2015. ^ "International Roundup: Sebastian Giovinco dazzles as Italy secure Euro 2016 berth". MLS Soccer. 13 October 2015. Retrieved 15 October 2015. ^ Ben Gladwell (24 May 2016). "MLS play cost Andrea Pirlo, Sebastian Giovinco their Italy chance - Conte". ESPN FC. Retrieved 27 May 2016. ^ Jeff Carlisle (25 May 2016). "Toronto FC's Sebastian Giovinco vows to earn his way back to Italy squad". espnfc.com. Retrieved 27 May 2016. ^ "Italy not calling up Sebastian Giovinco because MLS 'doesn't count' - Ventura". ESPN FC. 7 November 2017. Retrieved 20 November 2017. ^ Gladwell, Ben (15 November 2017). "Italy should have picked Sebastian Giovinco for qualifiers - agent". ESPN FC. Retrieved 22 April 2018. ^ "Giovinco back in Italy squad". Football Italia. 5 October 2018. ^ Matthew Doyle (15 October 2015). "Armchair Analyst: Sebastian Giovinco's golazo, Mauro Diaz's magic, and some clarity for Portland Timbers". MLS Soccer.com. Retrieved 4 November 2015. ^ "Juve: c'è Giovinco, la forza fresca" (in Italian). Tuttosport. 9 February 2010. Archived from the original on 16 March 2010. ^ "Giovinco To Toronto early". Juventus.com. Retrieved 2 February 2015. ^ a b "Giovinco could offer TFC an element of fantasy". Sportsnet.ca. Retrieved 18 January 2015. ^ "Ghirardi: "Riprenderei Giovinco e so cosa offrire alla Juve"" (in Italian). Tutto Sport. 24 February 2014. Archived from the original on 20 January 2016. Retrieved 18 January 2015. ^ a b "Toronto FC signs Juventus midfielder Sebastian Giovinco". Sportsnet.ca. Retrieved 18 January 2015. ^ a b Davide Lattanzi (23 July 2010). "Deschamps e Cagni sull'idea Giovinco: "Ventura, Sebastian deve giocare da ala"" (in Italian). Il Corriere della Sera. Retrieved 11 May 2015. ^ Andy Edwards (27 August 2017). "VIDEO: Giovinco's latest free-kick masterpiece feels like cheating". NBC Sports. Retrieved 13 December 2017. ^ "Toronto FC coach Vanney unfazed by rare Giovinco penalty miss". TSN. 7 March 2017. Retrieved 13 December 2017. ^ Devang Desai (27 April 2017). "The Secret Behind Giovinco's Penalty Kicks". Toronto FC. Retrieved 13 December 2017. ^ "Toronto FC sign Sebastian Giovinco". Toronto FC. 19 January 2015. Retrieved 17 August 2015. ^ "Sebastian GIOVINCO" (in Italian). Gazzetta dello Sport. Retrieved 15 September 2007. ^ Antonio Labbate (21 June 2012). "The doubts about Giovinco". Football Italia. Retrieved 22 August 2016. ^ Jeff Carlisle (7 December 2017). "Giovinco's continual evolution in MLS at the heart of Toronto's success". ESPN FC. Retrieved 13 December 2017. ^ John Molinaro (8 May 2018). "Toronto FC forward Jozy Altidore ruled out 4-6 weeks". Sportsnet. Retrieved 29 July 2018. ^ "È nato Jacopo Giovinco, le congratulazioni della Juve" (in Italian). Tuttosport. 21 May 2013. Archived from the original on 27 November 2015. Retrieved 22 September 2015. ^ Courtney Shea (22 May 2018). "Match: TFC's Sebastian Giovinco won over his long-time partner, Sharj Milano, with a smile". The Globe and Mail. Retrieved 29 May 2018. ^ Simon Borg (9 December 2016). "Sebastian Giovinco goes 1-on-1 with MLSsoccer.com ahead of MLS Cup 2016". www.mlssoccer.com. Retrieved 28 July 2018. ^ Bianca Teixeira (27 July 2018). "Inside Sebastian Giovinco's home: Meet the Toronto FC star and sneaker fanatic's beautiful family". Hello! Magazine Canada. Retrieved 28 July 2018. ^ a b c d e f g h i j k l "Sebastian Giovinco » Club matches". World Football. Retrieved 9 September 2015. ^ "Sebastian Giovinco". ESPNsoccernet. Retrieved 26 September 2011. ^ a b "Giovinco, Sebastian" (in Italian). FIGC. Retrieved 19 October 2018. ^ "Sebastian Giovinco wins Golden Boot, is first to lead MLS in goals, assists". si.com. 26 October 2015. Retrieved 14 December 2016. ^ "Toronto FC's Giovinco showing MLS who real MVP is". torontosun.com. 15 November 2016. Retrieved 14 December 2016. ^ Neil Davidson (31 October 2017). "Giovinco free kick puts boots to Red Bulls as TFC takes 1st leg". CBC Sports. Retrieved 31 October 2017. ^ "Giovinco, free-kick maestro: How he stacks up against Europe's best". mlssoccer.com. 31 October 2017. Retrieved 31 October 2017. ^ "Sebastian Giovinco Makes History: Fastest Player in MLS History to 100 points". Toronto FC. 3 June 2018. Retrieved 21 August 2018. ^ "Sebastian Giovinco". Eurosport. Retrieved 9 July 2015. ^ Laura Armstrong (30 November 2016). "Toronto FC bound for MLS Cup final". The Star. Retrieved 12 December 2016. ^ Benjamin Baer (1 August 2016). "2016 Team of the Week (Wk 21): Toronto take Trillium Cup thanks to Giovinco". MLSSoccer.com. Retrieved 12 December 2016. ^ Arun Srinivasan (26 May 2017). "Toronto FC routs Columbus to capture Trillium Cup". The Score. Retrieved 31 October 2017. ^ "Bradley, Giovinco to represent TFC at MLS All-Star game". sportsnet.ca. Retrieved 21 July 2017. ^ "Sebastian Giovinco Named to 2018 MLS All-Star Game". torontofc.ca. 28 June 2018. ^ "2015 MLS Best XI revealed: 10 first-time selections get the nod". Major League Soccer. 29 November 2015. Retrieved 29 November 2015. ^ "Sebastian Giovinco is the 2016 Audi Player Index leader". www.mlssoccer.com. 25 October 2016. Retrieved 31 October 2017. ^ "Sebastian Giovinco and TFC - Audi Player Index Spotlight". www.mlssoccer.com. 30 October 2017. Retrieved 31 October 2017. ^ "Audi Player Index Award". www.mlssoccer.com. Retrieved 31 October 2017. ^ "RFB Toronto FC "Man of the Year" Award". redpatchboys.ca. Retrieved 1 July 2018. ^ "2018 SCCL - Best XI". CONCACAF. Retrieved 26 April 2017. ^ "Mexico leads way in Concacaf Men's Best XI". www.concacaf.com. 15 January 2019. Retrieved 16 January 2019. ^ "Lozano caps brilliant 2018 with Concacaf Male Player of the Year Award". www.concacaf.com. 15 January 2019. Retrieved 15 January 2019. Wikimedia Commons has media related to Sebastian Giovinco. This page was last edited on 15 April 2019, at 18:59 (UTC).